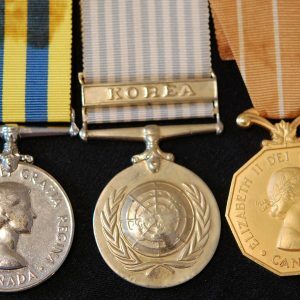 The Great War Medals to Major George Stewart Ryder, 236th MacLean Kilties/ 71st York Regiment. Born at St. Stephen, New Brunswick. 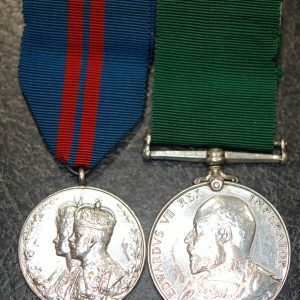 British War and Victory medal pair both named to “Major G.S. 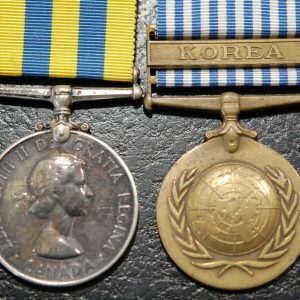 Ryder”; Colonial Auxiliary Forces Long service medal (Geo V) to “Lt. Col. G.S. Ryder, York Regt;” Colonial Auxiliary Forces Officer’s Decoration (Geo V) “Major G.S. 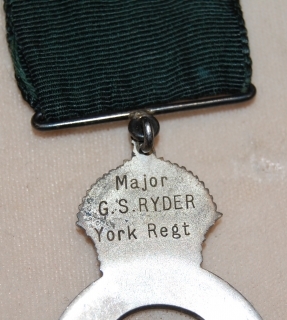 Ryder, York Regt.” With a Royal Canadian Legion Past President medal engraved “G. Stewart Ryder, Saint Croix, N.B. #9 1930”; Silver hallmarked ID bracelet engraved “Major G.S. 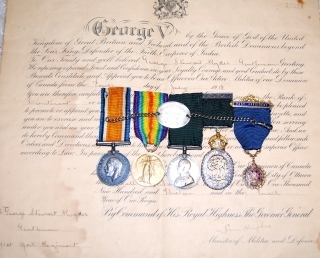 Ryder, 236th Bn C of E C.E.F.” and a George V Officer’s certificate signed by Sam Hughes 1913. With a copy of his attestation paper revealing that George Stewart Ryder enlisted with the 236th New Brunswick Kilties. 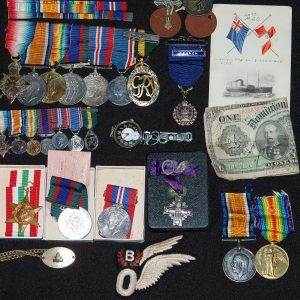 He listed 10 years of previous service with the 71st York Regiment. He was an electrician, by trade, and was born 29th November, 1891 at St. Stephen, New Brunswick.